Are you displeased with your smile due to crooked or gapped teeth? Are you experiencing pain from crowding or do you have a misaligned bite? The most common solution to these issues is getting braces, however, there may be a better option for you. Invisalign aligners are a discreet, comfortable and safe way to perfect your smile. One of the most dreaded aspects of getting braces is having unsightly metal covering up your smile. This is especially unnerving for adults, as they often associate braces with children and pre-teens. With Invisalign, you can let your smile shine through while straightening your teeth. Invisalign is a clear mold of your desired alignment that your teeth will form into over time. Get rid of the brackets and wires, try Invisalign! 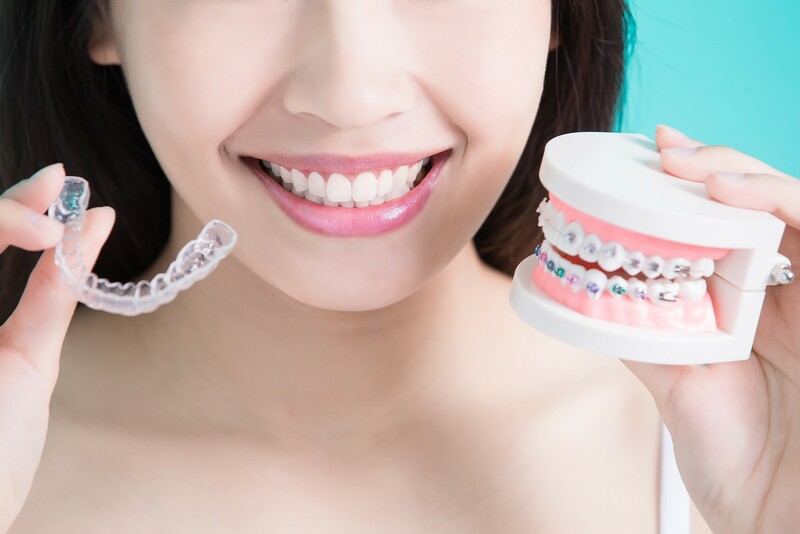 While there will always be a degree of discomfort when realigning your teeth, regular braces are clearly the more uncomfortable option. For example, the inside of your mouth needs to get accustomed to the metal brackets and you aren’t able to feel your teeth naturally for the entire duration of having them. Invisalign, on the other hand, is made of soft and comfortable material and you can remove them for brief periods of time. This makes for a much more pleasant experience. Coinciding with comfort, Invisalign is also safer than conventional braces. Normal braces have sharp bits of metal that can poke and irritate the inside of your mouth, sometimes causing small sores. Also, you can have accidents where the skin on the inside of your mouth gets stuck in the braces, which can cause bleeding. Furthermore, conventional braces can also affect the hardness of the enamel or decay of teeth. With Invisalign, none of these problems exist. On top of the other inconveniences of conventional braces, they also take much longer to fix your teeth. Normal braces can even take up to five years to be effective! Five years can seem like an eternity when you have a mouth full of uncomfortable and unsightly metal. Invisalign takes a fraction of the time, typically a year to a year and a half. To have your smile back in no time, go with Invisalign. Anyone who has ever had conventional braces knows this fact – corn is your worst enemy. Normal braces restrict you from eating sticky and hard foods as they can get stuck in or even damage your braces. Fortunately, you can take Invisalign braces out before you eat and drink. This beats picking your teeth all night after a meal. Just as eating certain foods can be difficult with traditional braces, it is also a challenge to properly clean your teeth. There are many more spaces for food and bacteria to get stuck in, and you can’t floss the traditional way. Oral hygiene with normal braces often requires different tools to get underneath brackets and thoroughly clean your teeth. Invisalign braces on the other hand can simply be popped out when you brush and floss then immediately be put back in. Did you know that traditional braces essentially work on a trial-and-error basis? Yes, orthodontists generally know how they are going to proceed, but nothing is exact. Patients with Invisalign can find out exactly what’s going on with their teeth, as the entire process is computerized on a timeline. If you want to increase the effectiveness of your Invisalign treatment, you can look into Acceledent. Acceledent is a Vibratory Orthodontic Device clinically proven to speed up orthodontic treatment by as much as 50% and reduce discomfort by up to 71%. It is a mouthpiece that vibrates your teeth, allowing them to realign more quickly. This works to speed up the process of Invisalign treatment. If you are looking to obtain a perfect smile with Invisalign, you are going to need a highly qualified dentist. Holistic Dental Center offers exceptional holistic and biological dentistry with surgical expertise in a friendly, home-like environment. We have give you a beautiful smile with Invisalign and so much more. For the very best in holistic dentistry, contact us today.